The ArchLabs team are proud to announce the release of our latest and updated release, 2018.05. I’m going to keep this announcement brief. There aren’t too many major changes with this release, mainly further polishing of the rough edges and furthering our vision for ArchLabs. Personally I rate this as our best, aesthetically looking desktop. LightDM has been completely removed, as a result you will be auto-logged in to your desktop. For those who prefer to use LightDM, you can reinstall this from AL-Hello. Openbox has been set as default but you can change this by editing your ~/.xinitrc and changing your session to your preferred WM/DE. 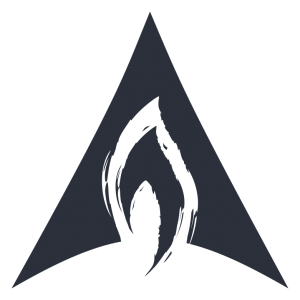 All ArchLabs related packages have been refreshed. Jgmenu especially has had an update and is in fine form. We are really happy with jgmenu, it is developing into one of the best menu utilities out there for Linux. 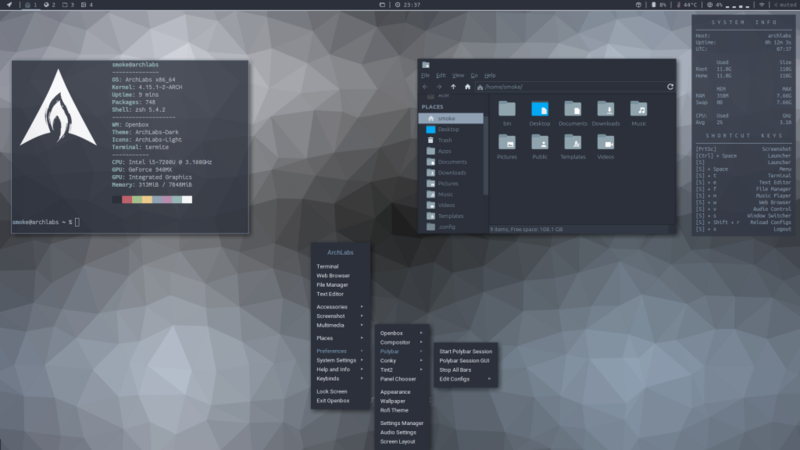 We have a new default wallpaper, created by Karl Schneider, considerable inspiration (as usual) comes from BunsenLabs and this time Manjaro and their new Openbox spin had an influence on the outcome as well. Neofetch has been removed and replaced with Al-Info, this can display a ASCII ArchLabs and your system information. Read more about AL-Info here. The deprecation of gksu has resulted in it’s removal from ArchLabs. Any applications requiring root will now make use of pkexec. We have switched to gnome-polkit and have also removed lx-session. 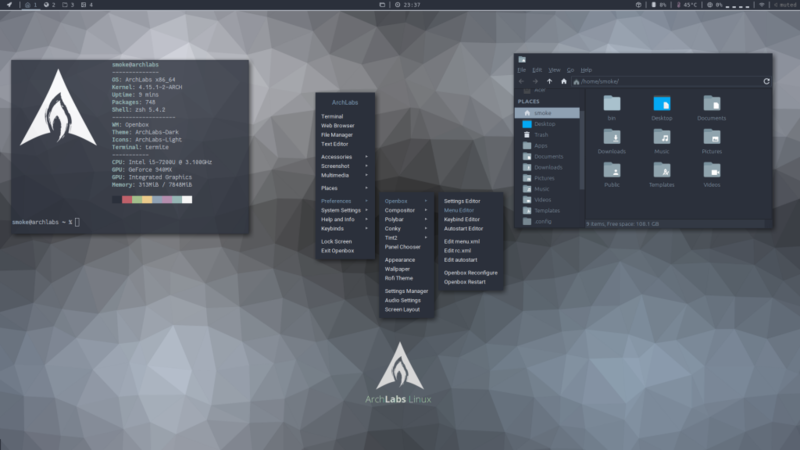 We have switched the default theme to ArchLabs-Light and icons to ArchLabs-Dark. Al-Hello has had further tweaking and polishing. There was some more tweaks and improvements to the pipemenus as well, you can now install selected apps from the Obmenu. In other news, our Reddit page has had an overhaul, this makes use of the new theme tools provided with the beta version of Reddit. To see these changes you will need to opt into their beta program. 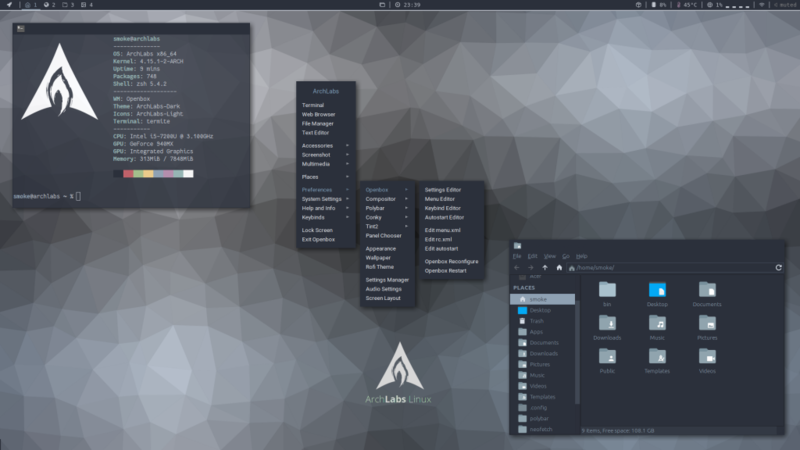 For those of you new to the AL-Installer (ABIF) and ArchLabs, forum member Sean Meininger created a walk-through. Click here. A video to accompany this is on its way. As per usual, if you encounter any bugs or issues please post them at our forum. Downloads for this latest release can be found at the “Get” section. I’d like to give a big congratulations to BunsenLabs on the Helium release, they have really outdone themselves on this latest release. Also a nod to Manjaro and their Openbox spin, well done guys. I know AL had a bit of influence on this one. A huge thank you as always, to our users and supporters.